 Diabetes is a universal disease that can afflict anyone, regardless of one’s age, weight, gender or race. And the number of diabetes is on the rise. Despite this, most people are still unaware of just how widespread diabetes is, and how serious its complications can be. Chances are you or someone you know has diabetes. Diabetes is four times more common than all forms of cancer combined, 1 in 3 North Americans have been diagnosed as diabetic or prediabetic, an 11 million live with the disease without even knowing it. Over 30% (24% pre-diabetic, 8,6% diabetic) or 1 in 3 North Americans (136 million people are diabetic or pre-diabetic. During the course of their disease, over 60% of diabetics will suffer from debilitating nerve damage known as diabetic neuropathy. Diabetes is one of the most widespread diseases in North America, with 8.6% people diagnosed with the disease today. Diabetes is on the rise- the number of diabetics increased by 8% every year. 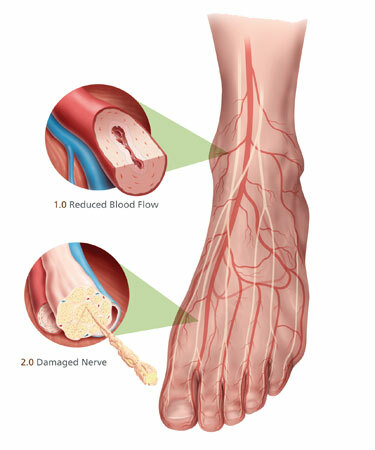 Diabetic neuropathy will affect over 21.6 million people and that is more than the entire population of New York State. Diabetic Neuropathy causes a loss of feeling in the feet and lower legs, where the nerves are damaged from high blood sugar levels. When minor injuries such as cuts, calluses and blisters occur, the numbness may cause them to go unnoticed, leading to ulcers and even surgical amputation. With neuropathy, everyday annoyances can become serious health threats. A rock in your shoe isn’t just one painful step- it could be a source of irreparable damage to your foot. Nothing puts more diabetics in the hospital than diabetic neuropathy. 25% of diabetics will have a minor foot injury develop into an ulcer. 1 in 5 over half of foot ulcers will require hospitalization, and 1 in 5 will require surgical amputation. Foot damage immediately doubles a dibetic’s likelihood of dying over the next decade when compared to a non-diabetic. Almost 100,000 Limbs are lost to diabetes each year in the United States. Every 30 minutes, one limb is lost to a landmine. Over the same time period, 60 limbs will be lost to diabetes.